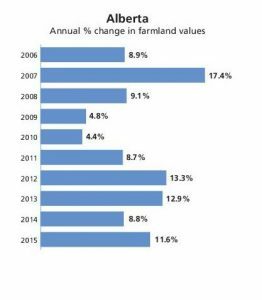 The average value of Alberta farmland increased 11.6% in 2015, following gains of 8.8% in 2014 and 12.9% in 2013. Values in the province have continued to climb since 1993. 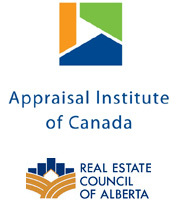 The majority of the province experienced a steady increase in farmland values throughout the year. The continued positive outlook on agriculture resulted in many producers purchasing land for expansion or to support succession planning. Agricultural land price increases were observed in northern, eastern and southern portions of the province, largely due to strong pulse crop prices. Continued strength in beef prices resulted in increased demand for land used for grazing in cattle producing areas as well. There were localized areas that started to reflect the impact of the downturn in the resource sector or appeared to have reached the point where the demand for cultivated land lessened.